Enter the burger van from hell. Q-Games have made some of our favourite titles over the last few years, and the PixelJunk series has provided hours (and hours) of entertainment (who doesn’t like PixelJunk Monsters? ), though there was a bit of a misstep with The Tomorrow Children. 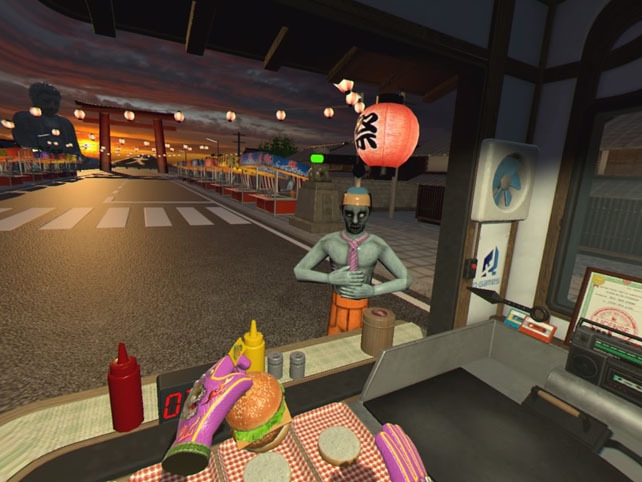 Taking things in a slightly different direction they’ve now released Dead Hungry, a VR game that sees you fending off zombie hordes by making them food from a mobile kitchen. It’s one way of dealing with the apocalypse at least, so how have they managed the transition to a more immersive genre? 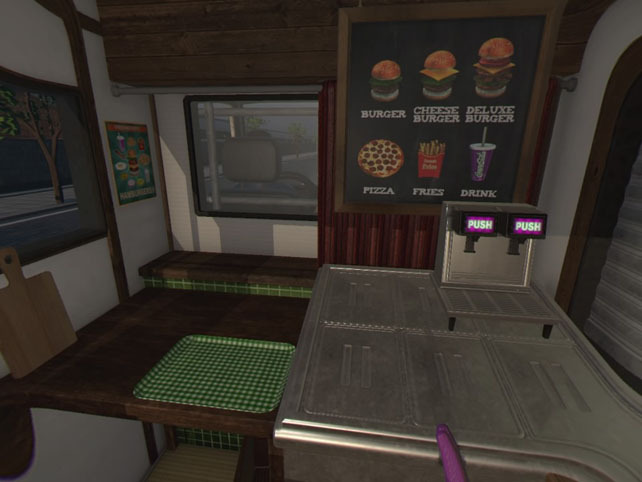 Dead Hungry is a time management sim at heart, very much in the vein of Diner Dash, just in a 3D immersive world. 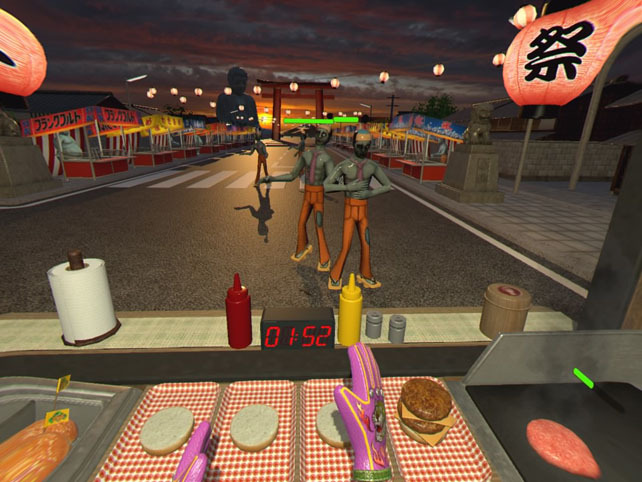 Having you situated in a burger van with all the cooking appliances and ingredients to hand, you need to make food and throw it at the zombies that amble towards your position. Fill them up with enough grub and you reverse the zombification and they run off happy… probably to get bitten and turn again. The better the food you give them the quicker you save the population and the faster the level finishes. Complete it in a decent time with a good score and you’ll be rewarded with a bonus item for use in later levels, or just to decorate your wagon. With the premise being so simple – make cook burger, add to bun, load up with cheese and salad, chuck at zombie – it’s easy to get into, especially with the Move controls linking to a hand each. The challenge comes in from the speed at which the zombies wind their way to the van and the variations on the zombie types, and it’s surprisingly difficult until you get into a rhythm. 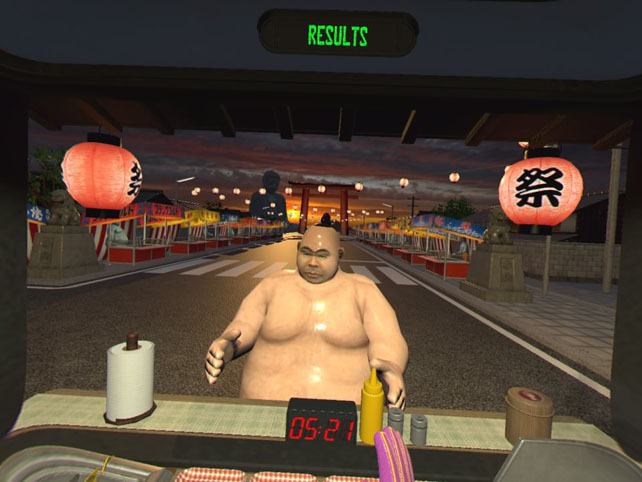 As with all VR games it’s the interactivity with the environment that provides a lot of the fun. Slapping patties on the grill, tossing pizzas into the oven, and deep frying prawns are intangibly satisfying, whilst messing around with the other objects is just entertaining. Figuring out what the undead will chow down on and not be sick with is trial and error, and you’d be surprised at what gives them a new lease of life. Of course, as you progress through the levels the enemy types get switched up and you have to think on your feet. Various specific conditions come into play like having no meat or limited resources giving rise to some innovative thinking… or just feeding them the biggest stack of salad you can throw together. It’s frantic and a balancing act between keeping things cooking and feeding the horde, and success is dictated by your actions alone. Well nearly yours alone, sometimes picking up ingredients can be a bit fiddly because they’re very close together, and after the fifth time you added a raw burger to a bun that you can’t remove you get a bit annoyed. You might also get a bit bored of the environments, or rather the one environment, because it doesn’t change any of the times you visit it. 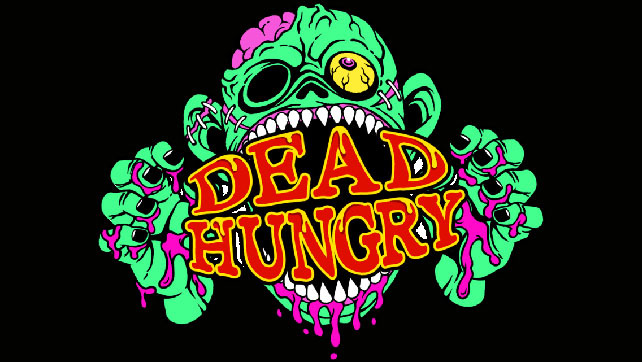 What Dead Hungry offers up is a resource management game with a twist that is fun for the first few levels, but gets stale fairly fast. There’s little incentive to repeat the levels unless you’re a 3-star hound, and the bonus items earned turn out to be single use. It’s a decent experiment and enjoyable in short bursts, however, it’s not up to the same standard as the other Q-Games titles and a bit overpriced for what it is. Pick it up if you’re desperate for more VR titles, though I’d recommend waiting for a sale. Dead Hungry is out now on PSVR, Oculus Rift and HTC Vive for around £16.